Como Park's Early Years. —. . Creating the Park . Saint Paul set aside land for parks as early as 1849 but did little to develop these areas because green space was plentiful and accessible in the small metropolis. As the population grew, however, creating parks became a priority. In 1873, the city purchased land along Lake Como, a beautiful setting located a convenient distance from the city. Although many felt the $100,000 purchase was too costly, it went forward thanks to the support of prominent citizens. 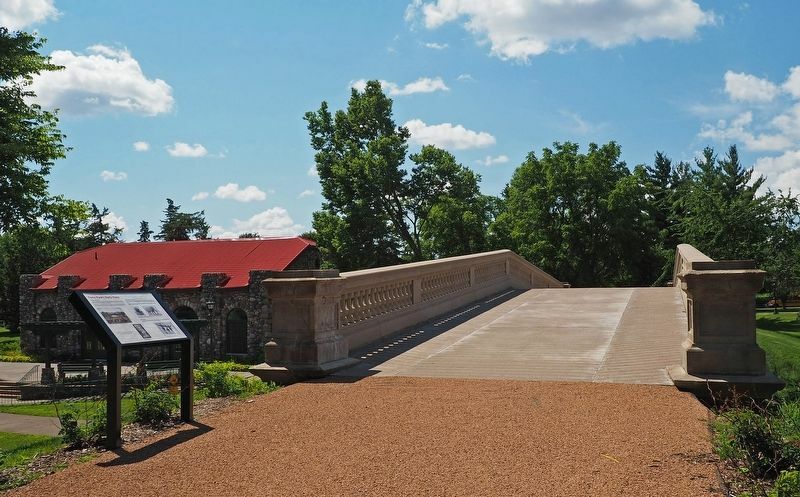 For fourteen years, Como Park received few improvements. When the Saint Paul Board of Park Commissioners was formed in 1887, though, its first project was to expand and develop the park. The board enlisted nationally renowned landscape architect Horace W. S. Cleveland to draft a comprehensive landscape design. Inmates from a nearby workhouse provided much of the labor to start implementing the plan, which included grading and constructing roads and planting more than 5,500 trees and shrubs. A Changing Landscape . Only part of Cleveland's vision for the park was completed before Frederick Nussbaumer became superintendent of the park system in 1891. While Nussbaumer carried out large parts of Cleveland's plan and appreciated the importance of preserving the natural setting, he knew that visitors also enjoyed more decorative features—and he was well aware that their taxes paid for the park's operation. Nussbaumer created diverse and exotic gardens that drew enthusiastic crowds. Palm trees lined the Banana Way and giant lily pads floated in the Aquarium pond during the hot summer months. Elaborate topiary sculptures were also popular. Other areas were inspired by gardens in France and Japan. Good Sports . Recognizing the importance of recreation, Nussbaumer developed baseball diamonds, tennis courts, and other areas for sports and play in the early twentieth century. High demand required a second round of construction in 1914, including facilities for skiing and for ice skating. Caption: The landscape around the streetcar line was beautified with flowers and trees. Caption: By the late nineteenth century, Como Park's naturalistic landscape became more ornamental with the introduction of topiaries, including a globe and an elephant. Caption: Like this girl, people felt as if they were "in Japan" when visiting Como Park's Japanese Garden. Caption: Downhill skiers enjoyed winter recreation at Como Park in 1917. Saint Paul set aside land for parks as early as 1849 but did little to develop these areas because green space was plentiful and accessible in the small metropolis. As the population grew, however, creating parks became a priority. In 1873, the city purchased land along Lake Como, a beautiful setting located a convenient distance from the city. Although many felt the $100,000 purchase was too costly, it went forward thanks to the support of prominent citizens. in 1891. While Nussbaumer carried out large parts of Cleveland's plan and appreciated the importance of preserving the natural setting, he knew that visitors also enjoyed more decorative features—and he was well aware that their taxes paid for the park's operation. Recognizing the importance of recreation, Nussbaumer developed baseball diamonds, tennis courts, and other areas for sports and play in the early twentieth century. High demand required a second round of construction in 1914, including facilities for skiing and for ice skating. 3. 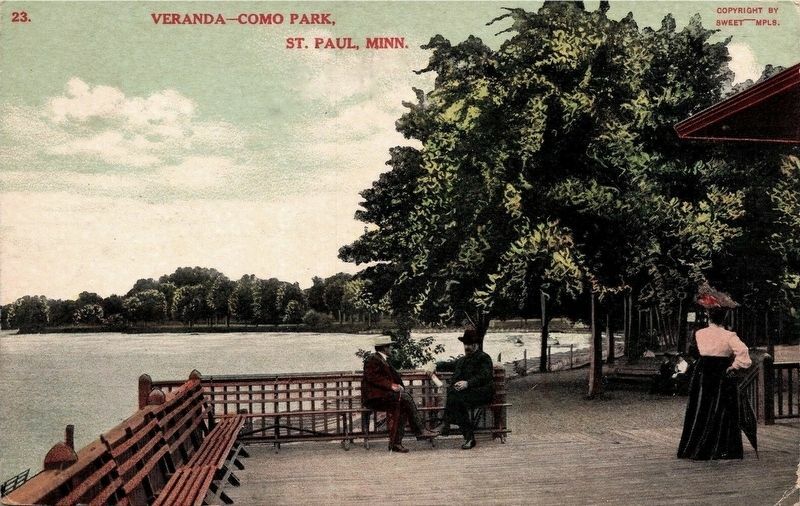 Veranda - Como Park, St. Paul, Minn. Location. 44° 58.713′ N, 93° 8.761′ W. Marker is in Saint Paul, Minnesota, in Ramsey County. Marker can be reached from Lexington Parkway north of Horton Avenue. Touch for map. The marker is at the north end of footbridge near the Historic Streetcar Station. Marker is at or near this postal address: 1224 Lexington Parkway N, Saint Paul MN 55103, United States of America. Touch for directions. Other nearby markers. At least 8 other markers are within 2 miles of this marker, measured as the crow flies. The Melan Arch (within shouting distance of this marker); Streetcars to Como (within shouting distance of this marker); The Picturesque Landscape (within shouting distance of this marker); The Hamline Plaza (approx. 1.2 miles away); Al Avila (approx. 1½ miles away); Terry Reynolds (approx. 1½ miles away); Kenneth Wayne Stauffer (approx. 1½ miles away); Tom Greenwade (approx. 1½ miles away). Touch for a list and map of all markers in Saint Paul. More. 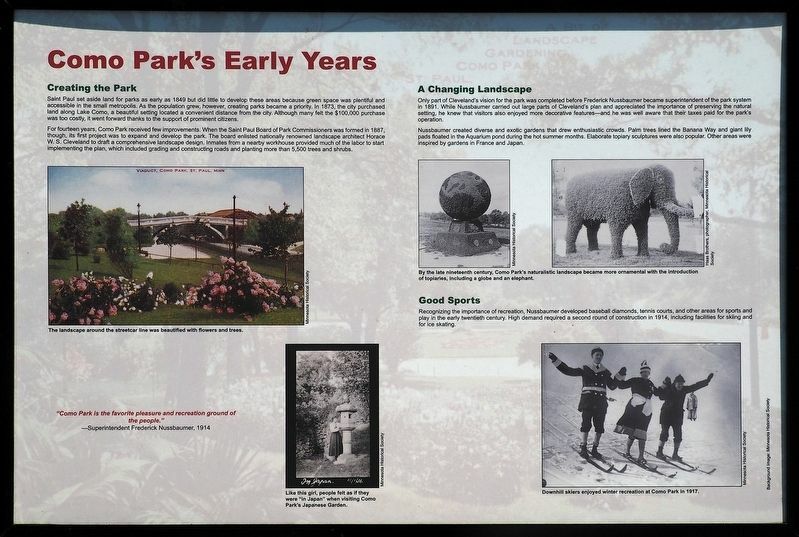 Search the internet for Como Park's Early Years. Credits. This page was last revised on March 13, 2019. This page originally submitted on February 4, 2019, by McGhiever of St Paul, Minnesota. This page has been viewed 40 times since then. Last updated on March 7, 2019, by McGhiever of St Paul, Minnesota. Photos: 1, 2. submitted on February 4, 2019, by McGhiever of St Paul, Minnesota. 3. submitted on February 5, 2019. • Andrew Ruppenstein was the editor who published this page.